Background: Cystectomy for ovarian endometriomas is commonly performed, however recent publications have shown a deleterious effect of cystectomy on ovarian reserve. Objectives: The study aimed to evaluate what effect laparoscopic cystectomy for ovarian endometriomas has on the ovarian reserve. Methods: This is a prospective cohort study performing standard laparoscopic cystectomies for ovarian endometriomas. The primary outcome was the assessment of the ovarian reserve using Anti-Müllerian hormone (AMH), done pre- and six months postoperatively. Secondary outcome was spontaneous pregnancy during follow up. Results: We enrolled 59 participants. Twenty-five participants were lost to follow up and a further 3 were excluded from the analysis. The average age was 33.1 years. Thirty-one participants completed the six months follow up. The mean preoperative and postoperative AMH value was 3.21ng/mL [95% CI: 2.24 - 4.18ng/mL, SD 2.64] and 1.48ng/mL [95% CI: 1.06 - 1.91ng/mL, SD 1.17] respectively: equating to a 53.89% decline, P=0.002. 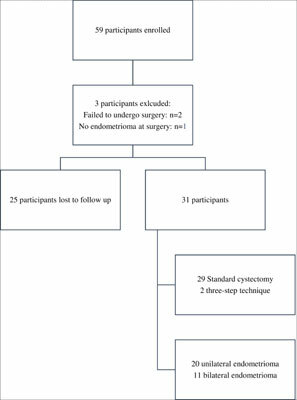 Twenty participants had unilateral cysts whilst the remaining 11 had bilateral endometriomas. The mean preoperative and postoperative AMH for unilateral cysts was 3.22ng/mL [95% CI:1.93 - 4.51ng/mL, SD 2.76] and 1.82ng/mL [95% CI: 1.23 – 2.41ng/mL, SD 1.26] respectively, representing a 43.48% decrease, P=0.072. Of the 11 with bilateral endometriomas, the mean preoperative AMH was 3.19ng/mL [95% CI: 1.49 - 4.89ng/mL, SD 2.54] with 0.88ng/mL [95% CI: 0.43 - 1.33ng/mL, SD 0.67] representing the postoperative AMH, equating to a 72.41% reduction, P=0.005. Conclusion: Serum AMH is negatively affected by laparoscopic cystectomy for ovarian endometriomas, with a significant decline in ovarian reserve as measured six months postoperatively. A greater decline was seen in patients with bilateral endometriomas compared to unilateral disease. Anti-Müllerian hormone, AMH, cystectomy, endometrioma, endometriosis, ovarian reserve, three-step technique.